The Arts Sub-Committee organised the annual Arts Coffee Morning, held on 15th February 2019 at Federation House. Around eighty-four members attended from ‘Derry and Antrim and Down, Fermanagh, Armagh and Tyrone’ to enjoy delicious scones, pancakes and traybakes served with the aroma of freshly made coffee and tea. Everyone was there, of course, to view the magnificent pieces of artwork on display. The theme for the Competition this year was ‘A Breath Of Spring’ and the room was adorned with lots of beautiful entries in the various creative classes. Federation Chairman Collette Craig presented the awards to the talented prize winners in Painting, Decoupage, Calligraphy and Good Handwriting. After the presentation of the trophies a raffle was held, which saw many lucky ladies winning great prizes. Arts Sub-Committee Chairman Lesley Dowds congratulated all the entrants on the high standard of works submitted for the competitions and proposed a Vote of Thanks to all those who had helped to make the event so enjoyable. She concluded by thanking everyone who had contributed to the success of the day. 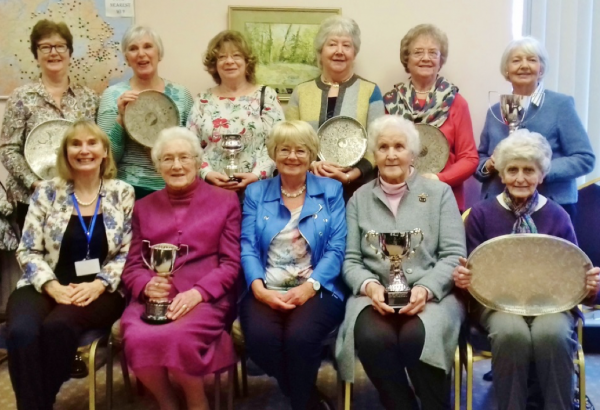 Some of the talented trophy winners, pictured with Federation Chairman Collette Craig (centre front) and Arts Sub-Committee Chairman Lesley Dowds (front left) at the Arts Festival Coffee Morning at Federation House.